Hurricane is an extreme form of weather in which winds circulate at very high speed – sometimes called rapidly circulating or rotating winds. Winds in the hurricane circulate at a speed of 70 to 200 miles per hours and last for many days or weeks. It is also accompanied by heavy rain and loud thunders. Hurricane has several names throughout the world, but its scientific name is ‘tropical cyclone’. Americans call them hurricane and Indians most often use the word cyclone, but many Asians call them as a ‘typhoon’. Whatever name they are called with, they are all the same. Hurricanes are formed when the warm surface of an ocean heats the air above it. The heated air rises upward in the atmosphere and causes the cold air to go down and become warm for rising again. This is a continual cycle that repeats and generates powerful thunderstorms. When a large number of thunderstorms are generated by the hot and cold air cycle, they start to spin with the rotation of our Earth and the wind speed grows. This all results in the formation of a hurricane. The rotation of hurricanes (tropical cyclones) depends on the region of their formation; if it is in the southern hemisphere it rotates in clockwise direction, and in the northern hemisphere it rotates in a counter-clockwise direction. A hurricane has three main structures which are eye, eye wall, and rainbands. These are important structure in hurricanes of various diameters and heights. 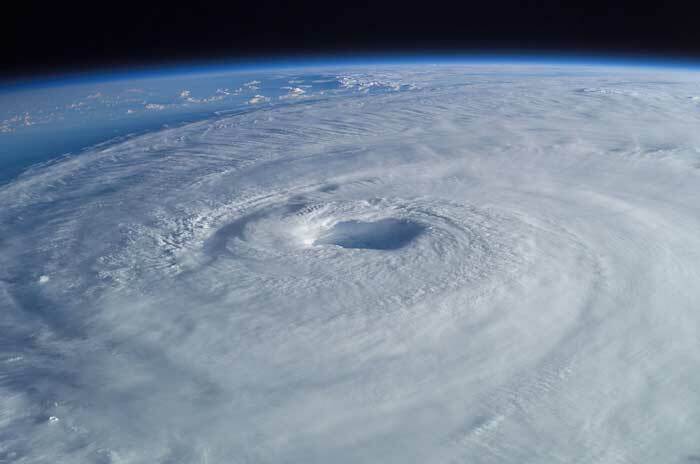 Eye (the center of a hurricane): The center of a hurricane is called the eye and it is the region with very low pressure compared to normal sea level pressure. This is the place where cold air sinks and is heated by the ocean’s warm surface to rise again. The eye of a hurricane is its very clear part; it doesn’t contain clouds and the weather is calmer. The typical diameter of the eye ranges between 30 to 65 kilometers. But a large eye of 370 kilometers in diameter has also been observed in very large hurricanes. Eye Wall: The calmer region in the eye is surrounded by a very dangerous part of a hurricane called ‘eye wall’. Eye wall of a hurricane contains very heavy clouds and the most powerful winds circulate there at a speed of 150 miles per hour. Rainbands: Hurricanes are not uniform in shape but they are made of many spiral bands made of clouds and are called rainbands. These spiral bands contain heavy clouds that rain heavily and cause large flooding if a hurricane reaches land. Diameter: Hurricanes can have varying sizes and their strength also depends on their size. 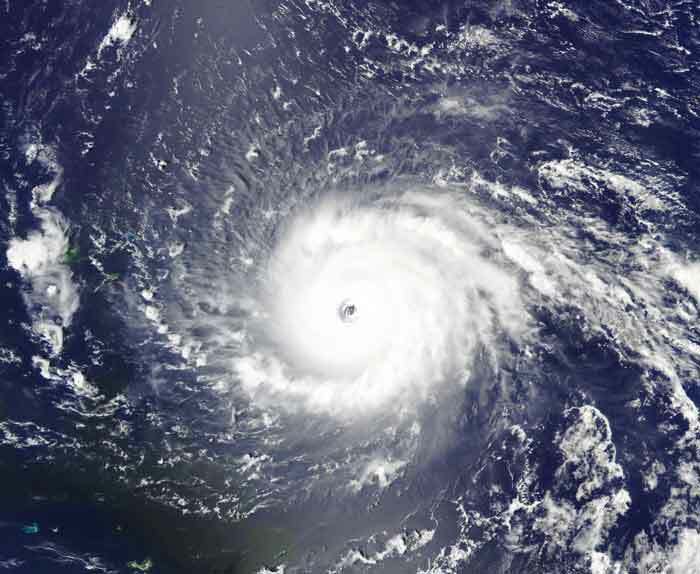 The size hurricane is found by measuring its diameter – length from one side to other. The typical range of diameter for a hurricane is 100 to 2,000 kilometers. Height: Hurricanes not only expand wider but they also expand upward in the atmosphere. The height of a hurricane is measured by measuring the height of thunderstorms in it. The largely sized hurricanes can easily grow to a height of 9 miles in the atmosphere. Regions where hurricanes occur frequently. Hurricanes are mostly formed in tropical regions over the oceans where the surface temperature is high. It is because a successful hurricane requires a continuous warmth of the ocean to sustain its existence. Otherwise, many hurricanes start to build regularly but fall apart quickly before taking their shape. The frequency of hurricanes also depends on the locations of the tropical region. There are around 7 locations in the world where hurricanes are formed more frequently. Each hurricane is given the name of men or women by meteorologists. The naming convention is maintained by the World Meteorological Organization (WMO). The United States gave the hurricanes only women’s name from 1953 up to 1970. The most powerful hurricane occurred in 1975 in Bangladesh which killed around 300,000 people. Abdul Wahab, "Hurricane (Tropical Cyclone)," in Science4Fun, April 12, 2019, http://science4fun.info/hurricane-tropical-cyclone/.